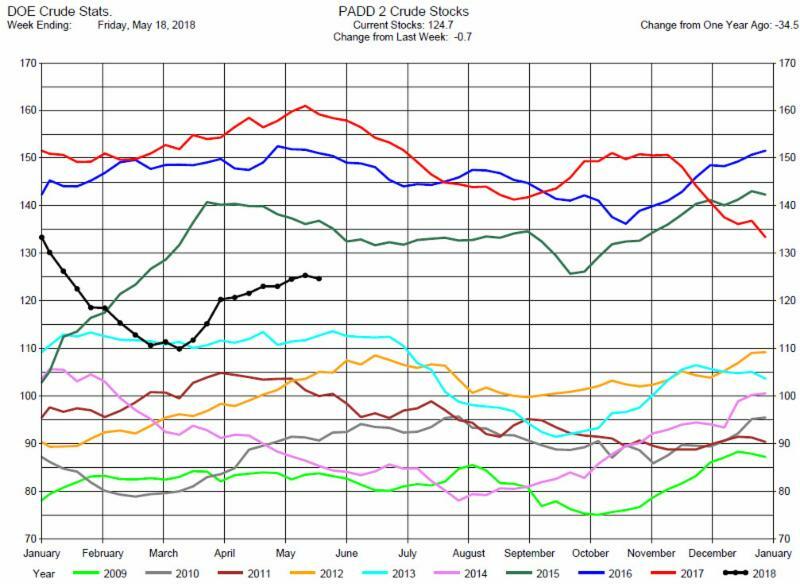 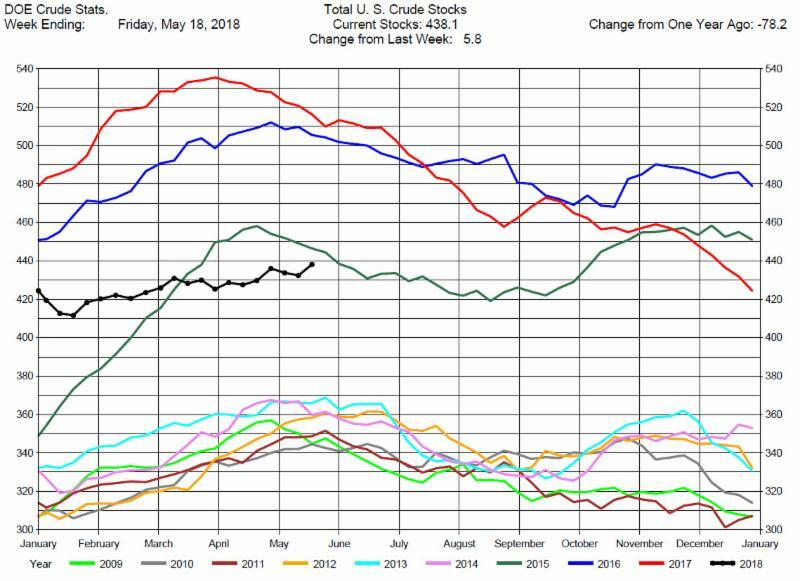 The DOE reported Total Crude Oil Inventories increased by 5.8 million barrels to 438.1 million barrels for the week ending May 18, 2018, expectations average was for a 2.2 million barrel decrease, with a range of 3.7 million draw to a .7 million barrel draw. 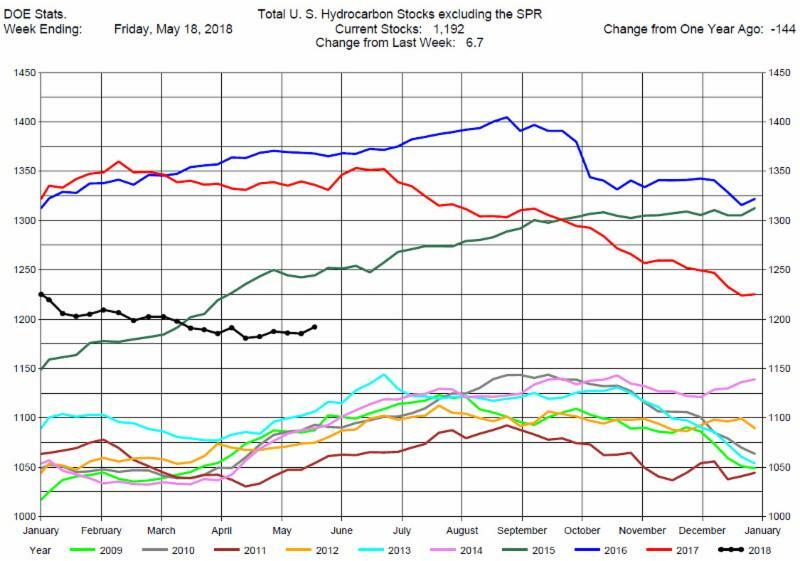 Overall hydrocarbon supplies increased by 6.7 million barrels. 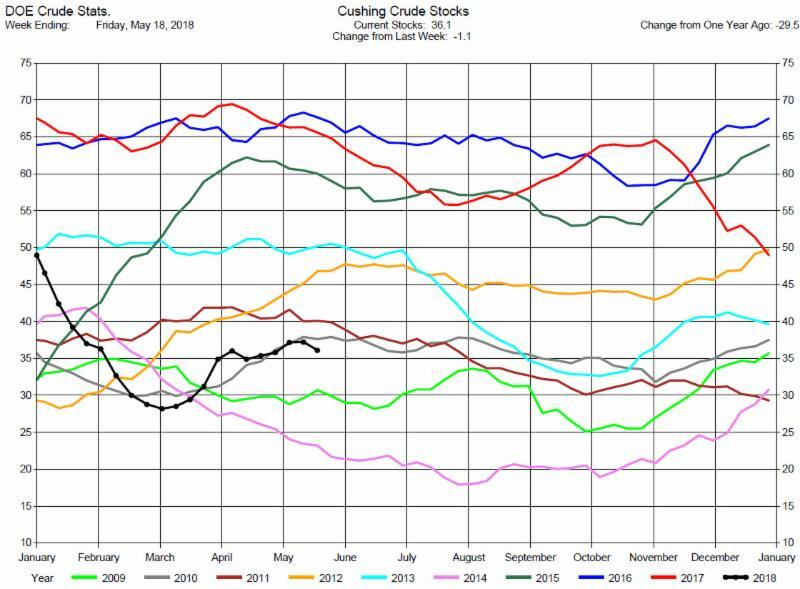 Crude Oil Production was unchanged at 10.7 million barrels per day. 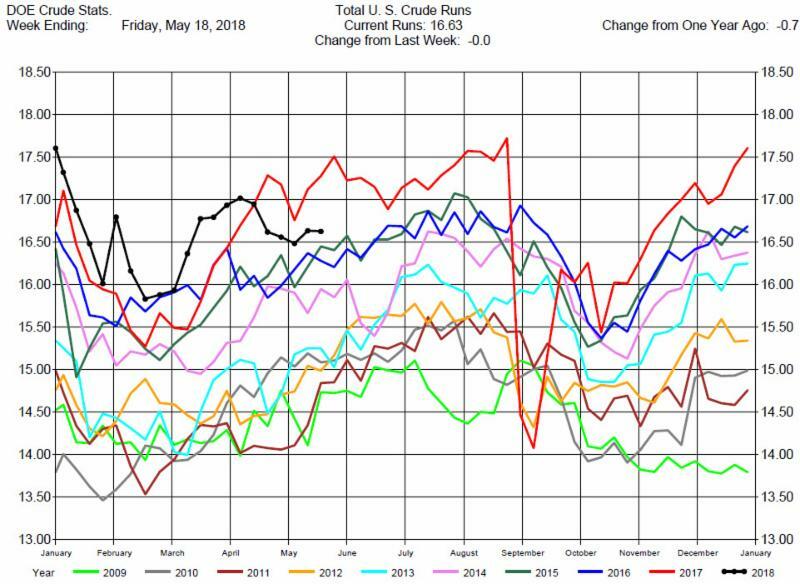 Total Refinery Crude Runs were off by 100,000 barrels per day to 16.63 million barrels per day. 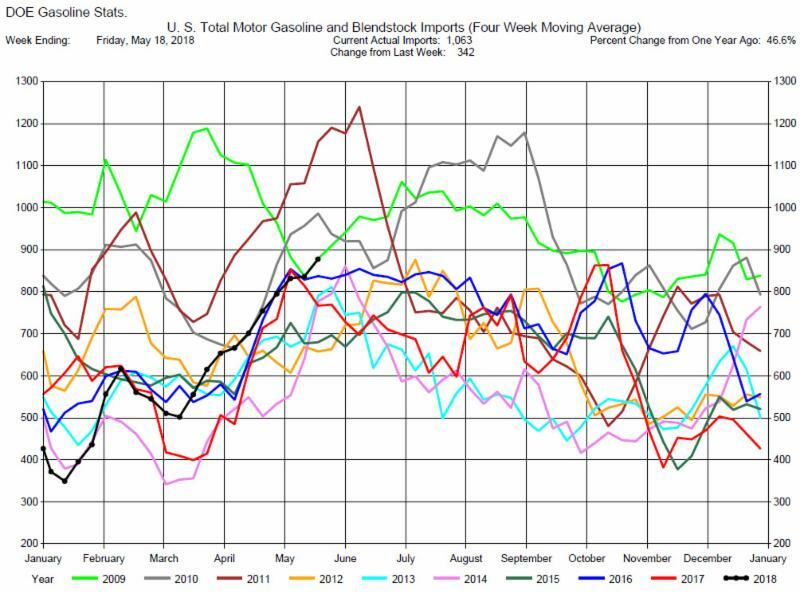 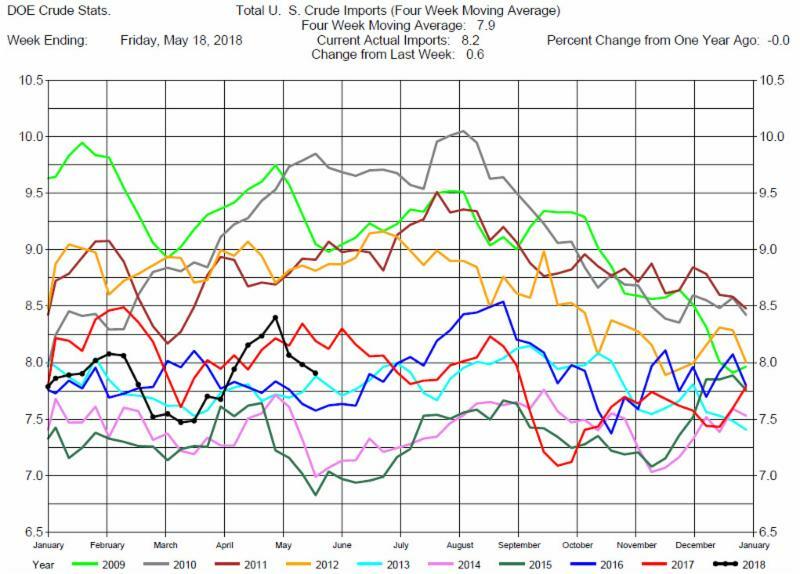 Total MotorGasoline Inventories increased by 1.9 million barrels to 233.9 million barrels for the week ending May 18, 2018, average expectations was for a draw of 1.4 million barrels, with a range of a draw of 4.7 million barrels to a .6 million barrel draw. 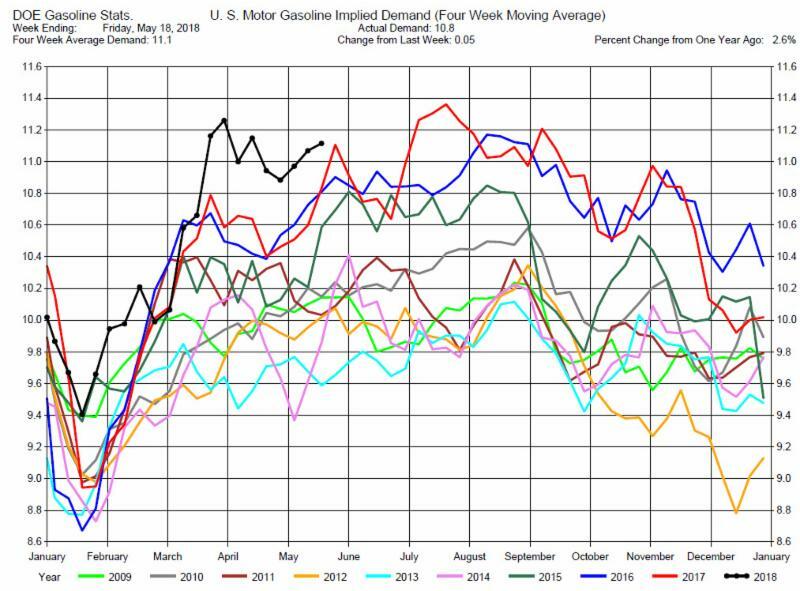 Implied Demand was off by 880,000 barrels per day at 10.85 million barrels per day. 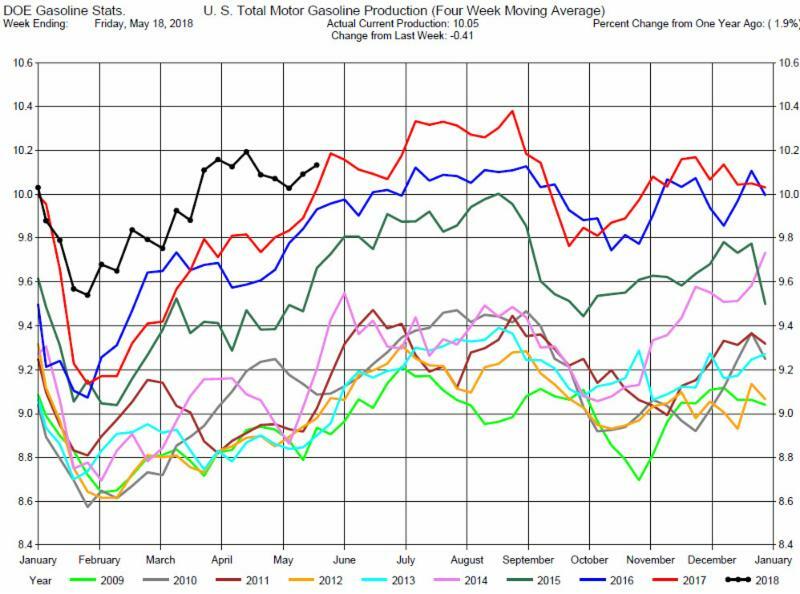 Gasoline Production was off by 410,000 barrels er day to 10.05 million barrels per day. 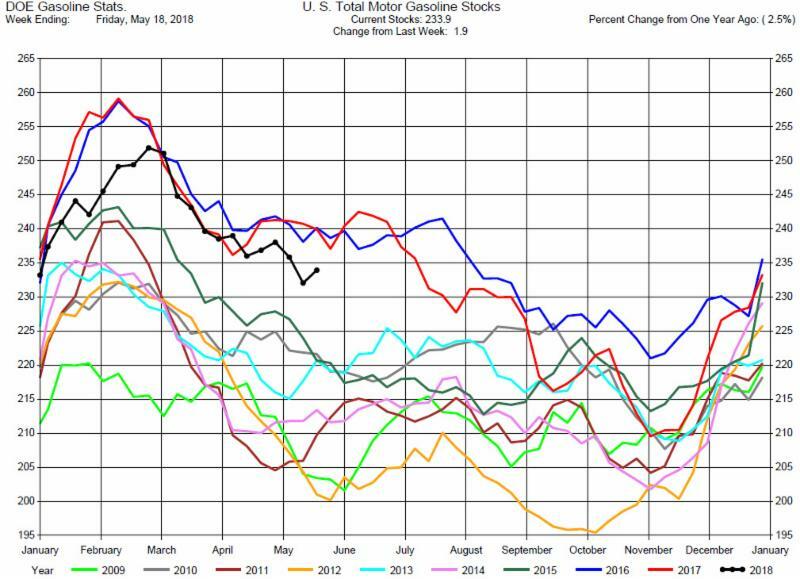 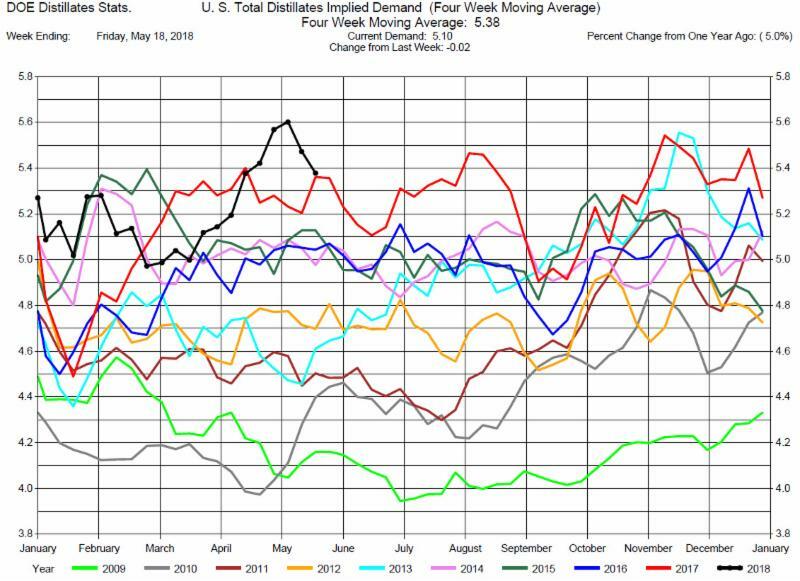 Total Distillates Stocks decreased by 100,000 barrels to 114.0 million barrels for the week ending May 18, 2018, average expectations was for a draw of 1.1 million barrels, with a range from a 2.6 million draw to a .5 million barrel build. 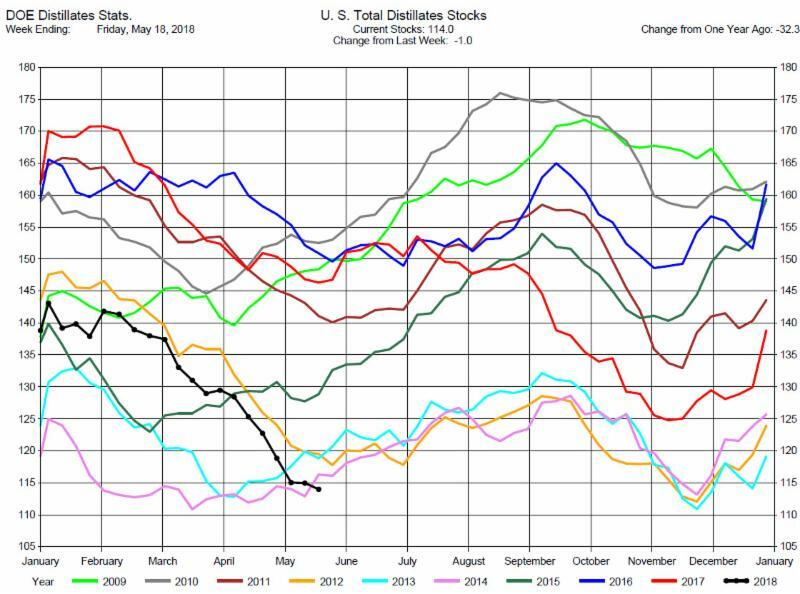 Stocks are now at record lows. 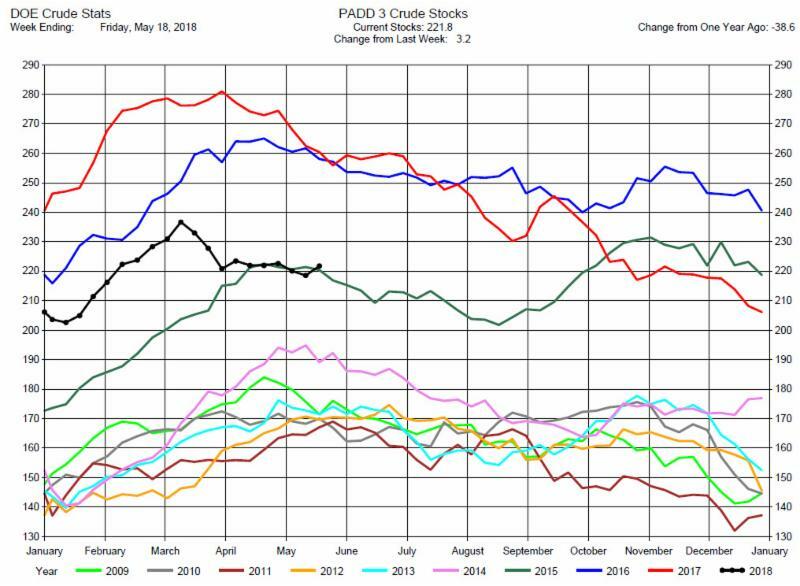 Cracks should be supported. 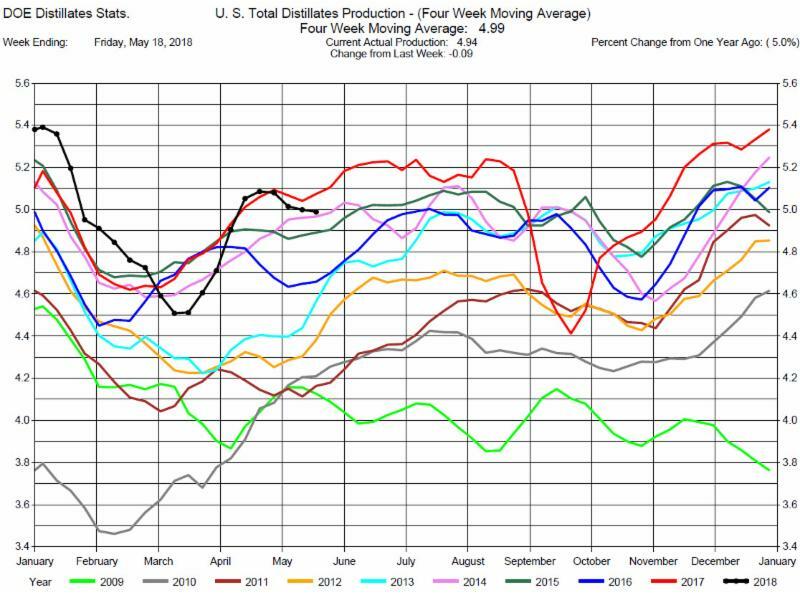 Distillates Production was down 90,000 barrels to 4.94 million barrels per day. 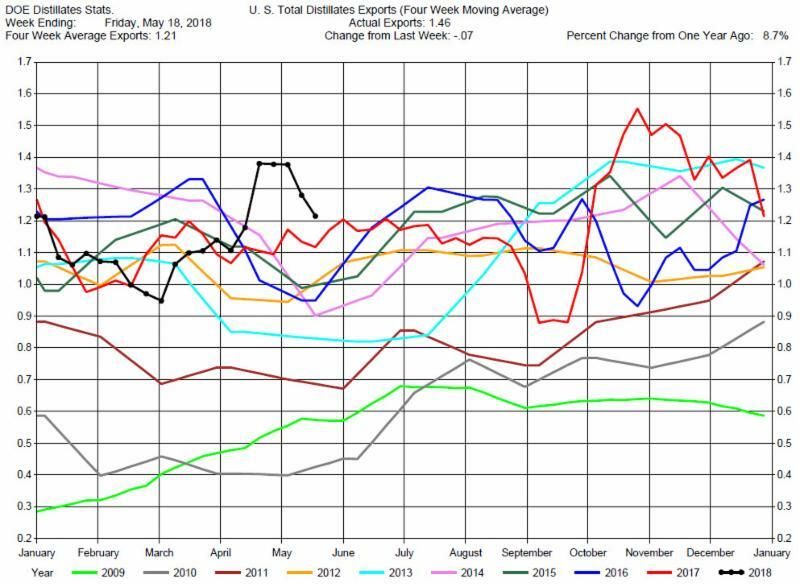 Total Distillates Implied Demand was down 20,000 barrels per day to 5.10 million barrels per day.